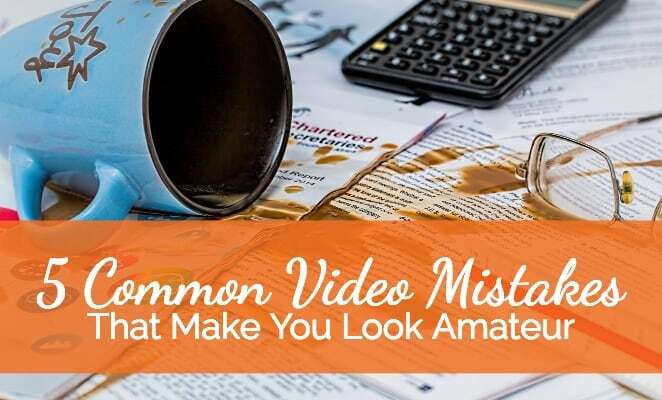 Online Video Mistakes: Are They Hurting Your Brand? Suddenly, the web got filled with terrible videos! Not to poke fun at others. After all, I've made some of these mistakes myself. The important thing is to learn from our (and other people's) mistakes, right? "Production values" refers to the technical aspects of a video: the visuals and sounds. The first mistake is having poor audio and images. This is normally caused by using sub-standard equipment. I'm not saying you shouldn't make videos if you don't have the best equipment. But at the very least, invest in a good microphone--they're inexpensive--and shoot your video in a place with plenty of natural light. I remember checking out a self-professed Facebook Live expert's videos and I was shocked. She appeared on-camera without any makeup on and sitting on her bed. I'm not saying you have to look like a supermodel or a Hollywood movie star in your videos. That certainly helps. But all that's necessary is to look neat and polished. Ladies, this means putting some makeup on. At least some powder and lip gloss. I mean, come on, even Roger Moore patted some foundation on before appearing on television! Guys, if you oily or blemished have perfect skin, try a dab of foundation, too. Avoid wearing plaid, stripes, and other too-busy patterns. Also avoid black; it absorbs too much light. Again, aim for neatness and stay true to your brand. And here's another common mistake: not looking at the camera! I know it's distracting when you can see yourself on your smartphone or computer screen. But resist the temptation! When you don't look at the camera, you're making it harder for your viewers to connect with you, which is an essential part of video. Train yourself to always look at the camera and avoid looking at yourself. Another common mistake is blubbering on and on, seemingly aimlessly, or chatting on and on. That's why some people hate watching online video! But if you're clear on what your video will deliver and you get to the point and stay interesting, then your audience will stick with you, even if your video is on the longer side. The antidote to this mistake is to organize your video. I like to make a showflow for each of my Facebook Live streams, for example. This isn't a script but rather it's more like a detailed outline that tells me the order of each topic. You could even just have a set of bullet points on a Post-It note. Whatever you do, don't start a video without knowing what point you want to make. Now that everyone and their grandmother are posting videos, you need to do everything possible to make your video stand out. A common mistake is not branding your videos. You can see for yourself how I'm using overlays to brand my Facebook Live videos. The app I'm using, Ecamm Live, makes it super easy for me to do that. But even if you didn't have these fancy apps, you can still brand your videos. One way is by being consistent with your backdrop and even the clothes you wear. How about always wearing the same color top? Or the same hat? There are many ways to do it. 5. No call to action. The last amateur mistake I see is not having a call to action. So the presenter does the video and then leaves the viewer hanging as to what the next action should be? When you're planning a video, start with the goal in mind. That will help you determine the best call to action or CTA to make at the end of your video. If you want to go deeper into this topic, then watch my presentation, "How to SHINE and Thrive in 2018... and Beyond!" Tell me, what are your biggest challenges with online videos? Post them in the comments below.